Kongo or Kikongo is one of the Bantu languages spoken by the Kongo and Ndundu people living in the tropical forests of the Democratic Republic of the Congo, the Republic of the Congo and Angola. It is a tonal language. It was spoken by many of those who were taken from the region and sold as slaves in the Americas. For this reason, while Kongo still is spoken in the above-mentioned countries, creolized forms of the language are found in ritual speech of Afro-American religions, especially in Brazil, Cuba, Puerto Rico, Dominican Republic and Haiti. It is also one of the sources of the Gullah language and the Palenquero creole in Colombia. The vast majority of present-day speakers live in Africa. There are roughly seven million native speakers of Kongo, with perhaps two million more who use it as a second language. Kikongo is the base for a creole used throughout the region: Kituba, also called Kikongo de L'état or Kikongo ya Leta ("Kongo of the state" in French or Kongo), Kituba and Monokituba (also Munukituba). The constitution of the Republic of the Congo uses the name Kitubà, and the one of the Democratic Republic of the Congo uses the term Kikongo, even if Kituba is used in the administration. The Hail Mary in Kikongo. At present there is no standard orthography of Kikongo, with a variety in use in written literature, mostly newspapers, pamphlets and a few books. Kongo was the earliest Bantu language which was committed to writing in Latin characters and had the earliest dictionary of any Bantu language. A catechism was produced under the authority of Diogo Gomes, a Jesuit born in Kongo of Portuguese parents in 1557, but no version of it exists today. In 1624, Mateus Cardoso, another Portuguese Jesuit, edited and published a Kongo translation of the Portuguese catechism of Marcos Jorge. The preface informs us that the translation was done by Kongo teachers from São Salvador (modern Mbanza Kongo) and was probably partially the work of Félix do Espírito Santo (also a Kongo). The dictionary was written in about 1648 for the use of Capuchin missionaries and the principal author was Manuel Robredo, a secular priest from Kongo (who became a Capuchin as Francisco de São Salvador). In the back of this dictionary is found a sermon of two pages written only in Kongo. The dictionary has some 10,000 words. Additional dictionaries were created by French missionaries to the Loango coast in the 1780s, and a word list was published by Bernardo da Canecattim in 1805. Baptist missionaries who arrived in Kongo in 1879 developed a modern orthography of the language. W. Holman Bentley's Dictionary and Grammar of the Kongo Language was published in 1887. In the preface, Bentley gave credit to Nlemvo, an African, for his assistance, and described "the methods he used to compile the dictionary, which included sorting and correcting 25,000 slips of paper containing words and their definitions." Eventually W. Holman Bentley with the special assistance of João Lemvo produced a complete Christian Bible in 1905. 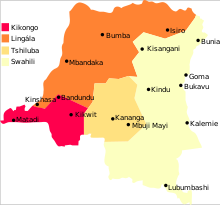 Kikongo belongs to the Bantu language family. According to Malcolm Guthrie, Kikongo is in the language group H10, the Kongo languages. Other languages in the same group include Bembe (H11). Ethnologue 16 counts Ndingi (H14) and Mboka (H15) as dialects of Kongo, though it acknowledges they may be distinct languages. There is contrastive vowel length. /m/ and /n/ also have syllabic variants, which contrast with prenasalized consonants. The Southern American English word "goober", meaning peanut, comes from Kongo nguba. The word "zombie" comes from Kongo nzombie, meaning "dead.". "Nfumu ya nzombie" is "Chief of the dead", or God. The name of the Cuban dance mambo comes from a Bantu word meaning "conversation with the gods". In addition, the roller coaster Kumba at Busch Gardens Tampa Bay in Tampa, Florida gets its name from the Kongo word for "roar". Many African slaves transported in the Atlantic slave trade spoke Kongo, and its influence can be seen in many creole languages in the diaspora, such as Palenquero (spoken by descendants of escaped black slaves in Colombia), Habla Congo/Habla Bantu (the liturgical language of the Afro-Cuban Palo religion), Saramaccan language in Suriname and Haitian Creole. ^ Hammarström, Harald; Forkel, Robert; Haspelmath, Martin, eds. (2017). "Core Kikongo". Glottolog 3.0. Jena, Germany: Max Planck Institute for the Science of Human History. ^ Hammarström, Harald; Forkel, Robert; Haspelmath, Martin, eds. (2017). "Yombe". Glottolog 3.0. Jena, Germany: Max Planck Institute for the Science of Human History. ^ Adam Hochschild (1998). King Leopold's Ghost. Houghton Mifflin. p. 11. ^ "Dictionary and Grammar of the Kongo Language, as Spoken at San Salvador, the Ancient Capital of the Old Kongo Empire, West Africa: Preface". World Digital Library. Retrieved 2013-05-23. ^ "Bartleby.com: Great Books Online -- Quotes, Poems, Novels, Classics and hundreds more". www.bartleby.com. Archived from the original on 2008-03-28. Retrieved 2017-07-21. ^ "Where does "funk" and/or "funky" come from and why the musical reference?". english.stackexchange.com. Retrieved 2017-07-21. Wikimedia Commons has media related to Kikongo. Bentley, William Holman (1887). Dictionary and grammar of the Kongo language, as spoken at San Salvador, the ancient capital of the old Kongo empire, West Africa. Appendix. London Baptist Missionary Society. Retrieved 2013-05-23. Congo kiKongo Bible : Genesis. Westlind UBS. 1992. Retrieved 2013-05-23. Cours de KIKONGO (1955) (French and Kongo language) par Léon DEREAU. Maison d'éditions AD. WESMAEL-CHARLIER, Namur; 117 pages. Leçons de Kikongo par des Bakongo (1964) Eengenhoven - Louvain. Grammaire et Vocabulaire. 62 pages. KIKONGO, Notions grammaticales, Vocabulaire Français – Kikongo – Néerlandais - Latin (1960) par A. Coene, Imprimerie Mission Catholique Tumba. 102 pages. Carter, Hazel and João Makoondekwa. , c1987. Kongo language course : a course in the dialect of Zoombo, northern Angola = Maloòngi makíkoongo. Madison, WI : African Studies Program, University of Wisconsin--Madison.